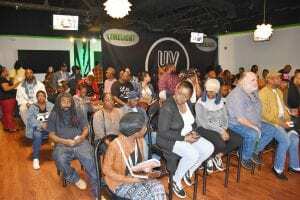 NASHVILLE, TN — Community advocates are reporting many voter registrations and applications for expungement of criminal records because of their events at the Limelight Events Center. 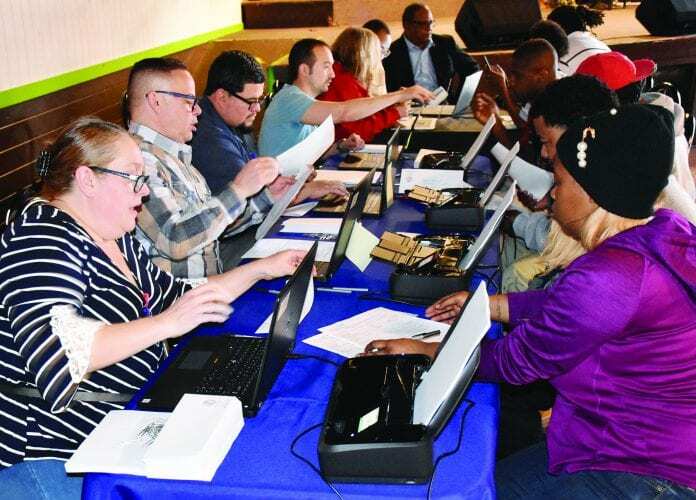 “The vast majority of those who apply are approved,” Criminal Court Clerk Howard Gentry said while volunteers from his office reviewed expungement applicants’ records during an event held by Justice For All. confers with another volunteer, as a young woman fills out a voter registration form. Expungement includes: a court finding that someone convicted of a crime has paid their debt to society; and an order for erasure of their record with restoration of citizen rights such as voting. With a secure internet connection, Gentry’s staff accessed Criminal Justice Information System computer records “to see what can be expunged,” Deputy Clerk Lillian Machado said while a young mother held her baby at a table for computers, printers, papers and signatures. Envelopes were provided for applicants to write names and addresses so expungement papers could be mailed to them. Gentry’s office processes applications, forwards them to the District Attorney who can present them to a judge. 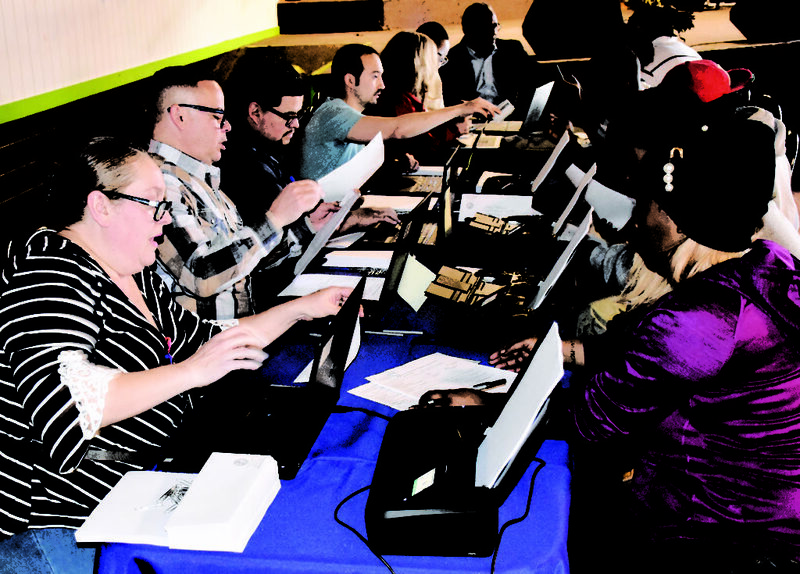 If approved, self-addressed envelopes are stamped and carry expungements to applicants who may register to vote. It also lets them tell prospective employers there’s no court record of conviction. 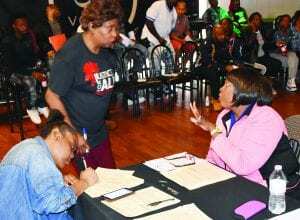 Community organizer Marilyn Brown, the contact person for Justice For All on Feb. 24, announced “350 expungements” were processed that Saturday in the Limelight Events Center, 201 Woodland Ave. Nearly 200 applications were processed during a similar event on Dec. 18, Brown said. 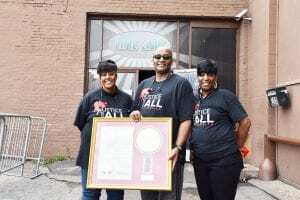 Limelight Events Center proprietor Dennis D. “DJ” Jones Sr. provided his venue to Justice For All. That morning, Rep. Brenda Gilmore gave Jones a state House proclamation recognizing him as a civic leader and respected businessman. “We had 74 newly registered voters today,” NAACP Nashville Branch Vice President Sheryl Huff said. “Close to 400-500 came through today.” Of 350 applications processed for expungement 62 were filed by people who were to “follow up on Monday” Feb. 26 to see what else could be done, Huff said. Those attending could get employment opportunities because: Trojan Labor’s Spence Lane office had a representative present; and the state Labor Department’s Mobile American Job Center van was manned in Limelight’s parking lot. “I’m praying they will do this one,” said Hazel Holmes, one of many parents and others attending with relatives seeking expungement. Judge Casey Moreland who faces federal charges alleging he tried to bribe someone with judicial favors. Henderson says he was stopped on Jefferson Street for a broken tail light in 2011 when an implied consent charge was dropped. The traffic stop included several injustices, he said. As Gentry arrived at the Limelight, he was asked if he could help Henderson. Gentry listened and later said, “His case is complicated” and he’s to visit the Criminal Court Clerk’s Office for a detailed conversation. 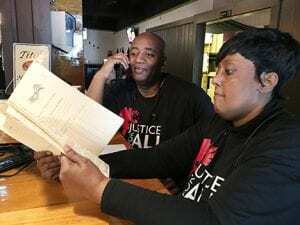 Antonio Henderson, 26, attended “to get expungement … and … better opportunities.” Two years in jail before pleading guilty, Henderson was sentenced to six years probation and time served for aggravated burglary. Jimmy West, 38, and Keyara Fisher, 27, said they got good information and seemed satisfied. Lauded for the program, Justice For All volunteers said more help’s needed for an April program. 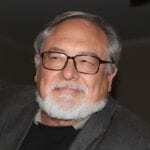 Previous articleIs the American Dream Still Possible? Does Privacy Matter More than Security?